Hexaferrum: Mineral information, data and localities. Named for the crystal morphology, being in the HEXAgonal system, and its composition, containing essential iron (Latin = FERRUM). The Fe analogue of garutiite, hexamolybdenum, osmium, and ruthenium. Said to represent a continuous solid solution, and Ir-, Os- and Ru-rich varieties are desribed. It was defined by Mochalov et al. 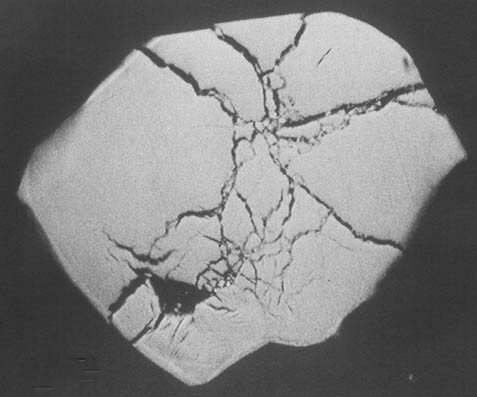 (1998) as a hexagonal close-packed (hcp) Fe mineral containing amounts of Ru, Os, or Ir. Cabri & Aiglsperger (2018) has re-examined hexaferrum together with a review of the phase chemistry in the Fe-Ni-Ir and Fe-Ru-Ir systems. They conclude that "the hcp (Fe,Ir) mineral correponds to the ε-phase of Raub et al. (1964) and should be differentiated from hexaferrum [(Fe,Os) and (Fe,Ru)] because it is separated by one to two miscibility gaps and therefore is not a continuous solid solution with Fe". Graph shows reflectance levels at different wavelengths (in nm). Top of box is 100%. Peak reflectance is 53.4%. Hexaferrum (Fe,Os) A variety of Hexaferrum rich in Osmium. Cabri, L.J. & Aiglsperger, T. (2018): A review of hexaferrum based on new mineralogical data. Mineralogical Magazine, 82: 531-538.